Ayaka has finally returned. Although she’s taken a break from public acitivty for these past two years, that hasn’t extinguished the “fire of creativity.” Her self-produced album “The beginning” is a testament to that. With a title that predicts the opening of the second act of her career, it makes one wonder what emotions surround the music. We went to meet her immediately. --As expected, you catapulted to top artist status with your debut song “I believe.” You continued to advance steadily after that, and it was big news when you announced that you would cease activity. It’s been two years since then. It seems like perhaps you’ve taken that time to gather your strength for a take-off. 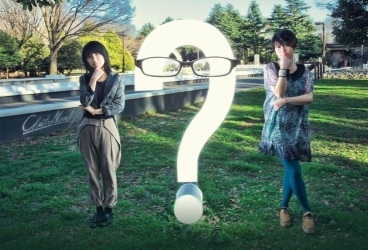 --For this interview we have both Yamaguchi (Vo) and Ejima (D) with us. Eijima: That’s not to say that I’m a better leader than Ichiro [Yamaguchi]. (laugh) To be honest, I was nervous at first, but as we four worked together, we began to understand one another better. Little by little we began to progress more smoothly. Y: Until now everyone just interpreted the motifs that I threw out, and so the images we came up with were rather scattered. But this time, because of Eiji the ideas are much more homogenized. 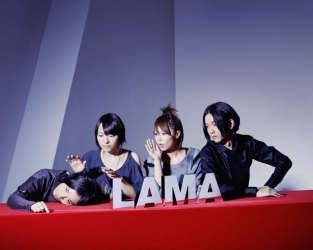 --[Furukawa] Miki, you were the impetus for the LAMA’s formation. Furkawa: You say that, but it wasn’t that cut-and-dried. (laugh) In the very beginning I was looking for a guitarist. I had been solo, and up to that point I didn’t know of a guitarist that made music as good as Nakako [Nakamura Koji, aka iLL], so I thought it would be great if I could get someone like him. Essentially, my number one requirement was someone who could do really cool feedback, and for whatever reason [Tabuchi] Hisako came to mind, so I thought, “If I could get together with her, I wouldn’t do solo work; I’d start a new project.” So while I was thinking about my solo work in a different light, I reached out to her and asked if we could do something together. --Did you and Hisako know one another before that? F: We actually hadn’t had the chance to meet. So even though I went to meet her, to an extent I was thinking that I needed to to whatever I could for my proposal. I’d already decided that my solo work would be too obscure, so I went for a direct meeting with her. Tabuchi: When I was in Number Girl I actually caught sight of Miki once during a festival, and I thought “She’s pretty cute,” but I didn’t even say “Hello,” so my heart was pounding. --Dir en Grey has completed their 8th album, “DUM SPIRO SPERO.” At a total of 14 songs - including the three singles “Hageshisa to, Kono Mune no Naka de Karamitsuita Shakunetsu no Yami,” “LOTUS,” and “DIFFERENT SENSE” - this is an album that even non-fans should listen to. Looking back at your previous album, “UROBOROS,” your superior performance skill and progressive song development collided within your epoch-making literary style, and it was a successful album that took the band’s originality to the limit. 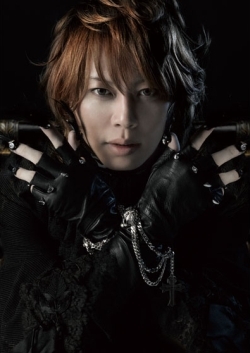 Kaoru (guitar): Around the time of “MACABRE” (2000), we were constantly listening to King Crimson and Pink Floyd. Maybe we were attracted by the fact that we couldn’t really understand them. Since Dir en Grey formed, our way of thinking has been “If it’s cool, it’s good.” Having said that, it’s not that we were just putting out music that’s not really that difficult; we were thinking about how to create an arrangement that sounds like Dir en Grey. As time went by, we wanted to make music that had more substance, so we created “UROBOROS.” We wanted to create an album to display the music that we’ve been developing all this time - the music we’ve been trying to make, the music that only we can make - and I think that “UROBOROS” achieves that. --First of all, what were your thoughts as you transitioned from production work to having the finished product? Kaela: I had a lot of different thoughts, but the number one thought hasn’t changed. I’ve given birth to my son, so the feelings and sense of responsibility that I have for my child have changed from what they were before. But the love that I have for music and singing hasn’t changed, and that’s good. It’s been very fun to be both “Kimura Kaela” and “Mother” without having to change who I am. Now, when I go home, ready or not, I step into my role as a mother, so there’s a very clear division there. And when I get to be Kimura Kaela [the performer] I do it with all my strength. --I can see you putting everything into the performance of your new song, “Kidoairaku Plus Ai,” which is definitely a violent rock tune. K: I’d decided to do a live because it’s summer, so I said to Shinoppi (Watanabe Shinobu), “Give me something crazy.” I’d been in a soft, tender mode, so I wanted to go hard instead. I asked him to give me something hard that I could sing during the climax of a live. --What was your impression when you first heard it? K: I thought, “Oh my god, this is so cool!” I wanted to write the lyrics right away, and I wanted to sing it. With the lyrics, I had a theme going of expressing love, which has no form, and other things that we don’t really understand. In my mind I had the image of joy, wrath, grief, and pleasure entering into love. My idea was that everything changes when you come into contact with someone if you add love to the equation. --First off, let me ask a frank question. Why did you choose to do a best-of album now? Miliyah: I wasn’t thinking about timing with this album at all. I’m not commemorating an anniversary, I’m not switching labels, and I’m not going on hiatus. (laugh) But about a year ago, during a production meeting, the topic of what constituted my best work cropped up. I was also interested in what the reaction would be when I released a best-of album someday, but I didn’t say that we should try it within the year, or that it should happen now. I thought I’d release it in my own time. --So you changed your mind? M: I did. I can’t really explain it, but lately I’ve been thinking that I’ve been doing music for a long time. And at the end of last year’s tour - I don’t think about anything but the tour during a tour, so I think about my feelings at the end of the tour - and at that time, for whatever reason, I felt that it would be better to release a best-of album before releasing the next original album. And after that I wrote “Yuusha-tachi,” and that the song gave me a push. I thought, “I’m living as a musician, and I wrote this great song!” and I drew strength from that. I was in the frame of mind that, if I could write a song like that, that I should take a short break. That’s when I decided to release this best-of album. 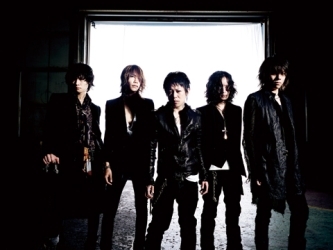 Kagrra, was a visual kei band known for their “Neo Japanese” style, combining a Western rock sensibility with traditional Japanese visual and musical elements such as kimono, koto, sensu, and magatama (the “comma” at the end of the band name). 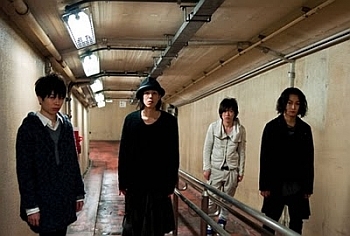 They were a unique thread in the tapestry of Japanese music for 11 years, then in 2010 they announced their plans to disband, releasing their final album in February 2011 and holding their final performance at Shibuya C.C. Lemon in March 2011. Unfortuantely, the “LAST LIVE” DVD lacks the spark that one would expect from a final live performance, has poor technical quality, and even cuts out elements that fans expect from any live DVD, leaving the viewer unsatisfied with the overall experience and uncertain about the DVD’s value as a collection piece. The DVD opens as the band takes to the stage. The stage itself is simply set: other than a projector screen behind the band, there’s nothing to take attention away from the band itself. Isshi (vocals) comes to the stage last and the band gets right into “Kotodama.” It’s energetic and fun, a great way to open a concert and get everyone into the mood. The band then moves into “Afurase Tanmaina” with its striking combination of heavy sound and delicate acoustic guitar. “Gen’ei no Katachi” gives us a great solo and some fun crowd interaction from Nao (bass), then the band goes into the more nostalgic-sounding “Shiroi Mashu,” and finally “Rin” begins to take the tempo down a bit. --It’s surprising to see that you’ve become so grown-up. Nishino: I’ve always wanted to be a grown-up (laugh), so I took advantage of the fact that I graduated from college this spring and I’ve been putting more denim into my personal fashion and darkened my hair... Even though they’re baby steps, I think it’s good that I’m going in the right direction, and I’m trying out all kind of things. --Congratulations on graduating from college! N: Thank you! Since I don’t have school anymore, I’ve had a lot more free time. It’s weird being at home so much, so I’ve been cleaning and cooking a lot. --This is a very dense album. What were your feelings as you started work on it? Takuya: When we create an album, first we create several songs, then select out the best 30 or so and go from there. We only wanted to add cool songs to the package, but this time it was mostly songs written by the other band members that rose to the top. We had six songs come up in a day, and we worked the bad music into good music, and tied it all down with the best original, high-quality finishing touches. --When you’re choosing music, what criteria do you select on? Perfume’s first double A-side of 2011: the thrilling electric sound of “Laser Beam,” and the impressive “Kasuka na Kaori” with it’s tender strains of piano. The variety of Perfume’s expressiveness is clear in the contrasting styles of these songs. We talk to the girls about this amazing single. --“Laser Beam” is a really great song. Nocchi: Thank you. We wrote this song for Kirin’s “Chuhai Hyouketsu” [alcoholic drink] commercial, which is why the lyrics have phrases like “Minoru kajitsu ga mizu wo hajiite” [“The fruit flicks through the water”]. --The phrase “Kokoro wo shuwari to tuskisasu no” [“It pierces my heart with effervescence”] is very impressive. --(laugh) The song has a futuristic feeling, but the sudden sense of reality that you get from the line “Ground ni tatsu kimi no sugata ga” [“Your figure as you stand upon the ground”] is also very interesting. --(laugh) You appeared in Summer Fest, after you completed your album tour last June. School Food Punishment (SFP) hasn’t had a lot of time in the limelight... What was it like? U: A little before the tour... After we finished the album, we were spending a lot of time doing interviews, and we spent a lot of time thinking about what we wanted to do next. The year of our debut we were moving so fast that we went from one thing to the next without even time to take it in, so we wanted to make a fresh start of things. We thought about where we wanted to start from, but we of course wanted to finish the tour... And after the tour we had Summer Fest, so we figured we could start after that. So we spent a lot of time preparing for whatever was coming up next. Hidai: It’s not that we never stopped doing work for the band - we weren’t writing songs while planning our next move - but instead we were constantly thinking about how we wanted the band to evolve. --The single, “Silent Scream,” has a feeling of extraordinary speed, as well as a bit of a dark atmosphere. Chisa: Until now we’ve had a lot of positive lyrics, but this time we’re singing about the things that we don’t tell to anyone, the things that we scream about in our hearts. Murmurs are so close to breathing, aren’t they? More than happy things, we did a lot of the things that we murmur about and reflect upon. We wanted to place importance on the “us” that only we know, and that’s the kind of lyrics we wrote. Suzuki: The sound is also closer to rock than we’ve ever done before. --This album is being released with four different CD jackets. Nishikawa: Well, let’s start with how I felt about making the 18-song album [First-Press Limited Edition B]. Once again I worked hard to convey the music, and I didn’t just throw away the single tracks, but instead included those songs; I looked them over and read between the lines when I tied them into the album. In contrast, [First-Press Limited Edition A] has 12 tracks of music that I released a long time ago or that met with critical reception. Limited Edition A also has music videos and making-of videos. The other two jackets are different from one another, but the songs on them are the same as the songs on Disc 1 of Limited Edition A. --Was there anything that you realized while working with the songs that were released 6 years ago? N: Yeah. I thought that I wanted to convey a message like “This is T.M.R.” I re-listened to what I’d created up till that time, and then decided that I wanted to convey how I’d come to be where I am now, and what things will never change. And there were the 6 year-old songs. (laugh) And songs that I couldn’t remember when I’d written them. But I realized that it’s fine to represent T.M.R. with those songs. --I listened to this album, and I thought that it was an incredible peice of work where the band’s vigor and the depth of the music really shines through. When did you start work on it? 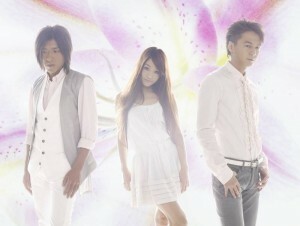 Mitsumura: We’ve been writing songs continually since around the time we concluded our Budoukan performance last year. We started talking about recording an album at the beginning of this year. We didn’t think about what kind of album, but instead we thought about which songs would be fun to play in a live. There were a lot of songs, and when it came time to add them to the album there were so many good ones that it was hard to pick. --Last year you released a mini album, “Awa Come.” Did recording it feel different from recording a full-length album? Fukuoka: It did. To begin with, with the big theme of “Awa Come” was that it was recorded in Tokushima [the band’s hometown], so this album was different from that. Before now we would release an album of our previous singles until we reached the end of them, but this time it was different. We didn’t release any singles, and we just thought “This is the concept we want for the album” and then made it, so it’s very special to us. Hashimoto: But I feel like they were somewhat connected. Although they were recorded in totally different places, we started working on this album, “YOU MORE,” when “Awa Come” went on sale. So the feeling of this album is close to that of “Awa Come,” and the impression of “Awa Come” is of having fun recording in Tokushima, and although the image of this album isn’t the same, they seem to be close to one another. --Almost half of the songs on this album are from demos that you made in advance. Noda: That’s right. We took some time off to look at the band. After our tour from year before last ended we each found something to reflect on and took the time to think about what we should do next. To that end, we didn’t get together for six months. But I still really wanted to write music, so I went to the studio by myself and worked alone. It was a good way to spend the time, and I found that music became even more interesting for me, and we were able to add those songs to this album. --You’d changed the way you wrote music. N: Yes. The result was a beautiful, magnificent album and I think that’s the biggest thing to come out of our break. I was able to express what the other three members have to say better than ever before. When we got the demo back, they understood what I was thinking about at the time. We didn’t get together and play the songs then listen to them one by one; to a certain extent we just let the finished product speak for itself. --With “eee-P!! !” you’ve completed your first album as a three-member group. 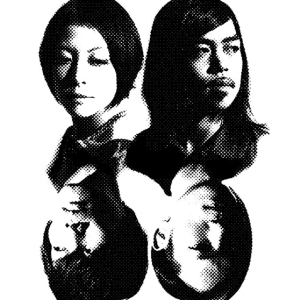 Hayashi: It’s an even more interesting album than I thought it would be. I’ve been doing POLYSICS for 14 years - March marks year 15 - and this album is really packed with the kind of inspiration that I had in the early days. --Since this is your first album as a three-member group, did you get the sense that you were spreading yourselves too thin? H: Ah hah hah. I think that every album! (laugh) It’s not so much that we thought, “Well, what do we do now that there’s only three of us?” but... We didn’t go overboard either. Instead, our tour after the release of “eee-P!! !” was a shot in the arm for us, and we started to wonder what it would be like if we tried doing the music that we really wanted to do. The feeling was very strong.